Evaluation of existing surface cracks is normally done during the visual inspection of structures. Crack opening on the surface of concrete is normally measured using a crack gauge. Depending on the opening of the cracks on the surface, cracks can be described (as tiny as hairline, or cracks with a few millimeters opening); however, this procedure does not provide enough information about the depth of these cracks. Different techniques have been developed and used over time for the purpose of crack depth measurement in concrete. But first, lets see why concrete cracks, and why crack depth measurement in concrete matters? Crack in concrete can occur before hardening stage; this is normally due to settlement within concrete mass, or cracks due to plastic shrinkage. But cracks can develop after hardening. For example, drying shrinkage can occur due to the loss of moisture. Thermal contraction and sub-grade settlement can also cause cracking in hardened concrete. Overloading, and weathering of concrete can also result in cracks. But why crack depth measurement in concrete matters? cracks can ease the access for aggressive agents (i.e. chloride ion) to reach to steel reinforcement, which will eventually cause corrosion. It is important to evaluate the depth of cracks, to make sure if surface cracking is well propagated into concrete or not. The effectiveness of repair methods such as epoxy injection relies on accurate prediction of crack depth. Different methods have been developed over years to evaluate the depth of cracks in concrete. In this method, dye is injected (using pressure) into surface cracks. Later, concrete cores will be taken from the area under investigation. 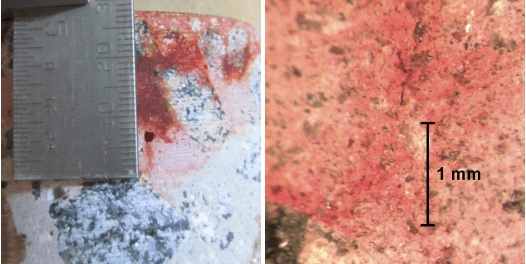 The sample is studied under microscope for determining the depth of cracks in concrete. Photo adapted from Kevic C Arne (2014). “Crack depth measurement in reinforced concrete using ultrasonic techniques” MSc. Thesis. In Impact-Echo test, a stress pulse is generated at the surface of the element. The pulse spreads into the test object and is reflected by cracks, flaws or interfaces, and boundaries. The surface response caused by the arrival of reflected waves, is monitored using a high precision receiving transducer (Malhotra and Carino, 2004). 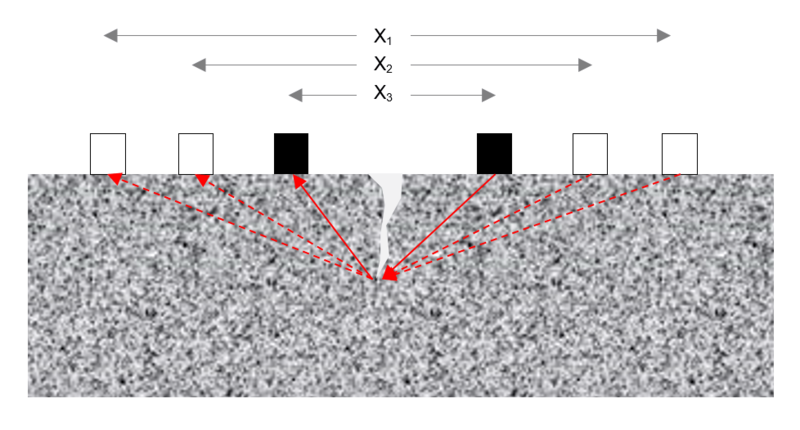 When stress waves travel within the concrete element, a part of emitted acoustic waves by the stress pulse on the surface is reflected over the boundary layers, where different the material stiffness changes. The data recieved by the transducer is normally analyzed in the frequency domain to measure the wave speed and the thickness. This procedure has been standardized as the ASTM C1383, “Standard Test Method for Measuring the P-Wave Speed and the Thickness of Concrete Plates Using the Impact-Echo Method”. However, Impact-Echo can be used to assess the depth of surface cracks. 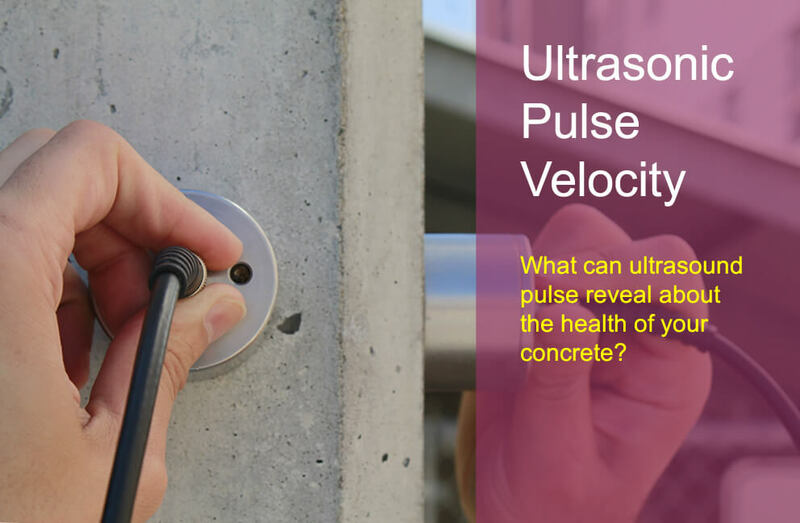 Ultrasonic Pulse Velocity (UPV) is an effective non-destructive testing (NDT) method for quality control of concrete materials, and detecting damages in structural components. The UPV methods have traditionally been used for the quality control of materials, mostly homogeneous materials such as metals and welded connections. With the recent advancement in transducer technology, the test has been widely accepted in testing concrete materials. 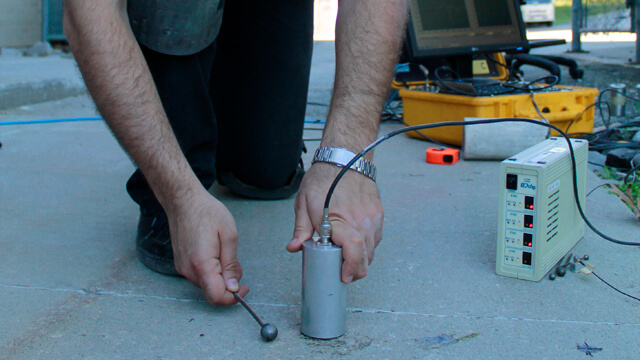 Ultrasonic testing of concrete is an effective way for quality assessment and uniformity, and crack depth estimation. The test procedure has been standardized as “Standard Test Method for Pulse Velocity through Concrete” (ASTM C 597, 2016). To learn more about UPV method, and its applications, click here. 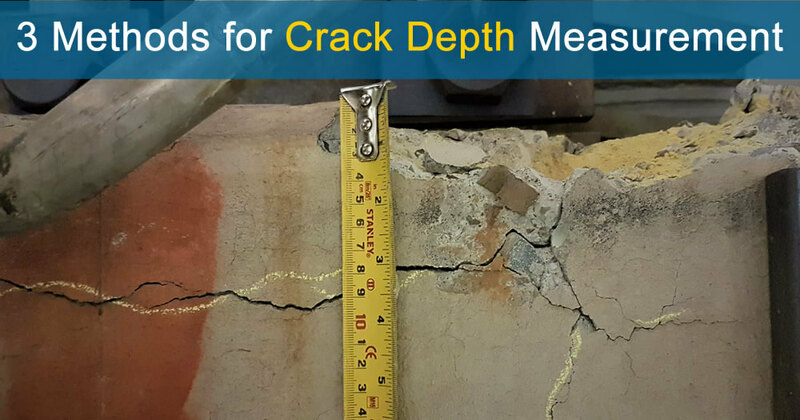 UPV method can be used for estimating the depth of surface cracks. To do so, each transducers should be place on one side of the crack, for a given distance. Then, the distance between transducers is changed in the same trajectory. the UPV measurement will be repeated for different spacing of transducers. Shiotani, T., and D. G. Aggelis. “Determination of surface crack depth and repair effectiveness using Rayleigh waves.” Fracture mechanics of concrete and concrete structures—design, assessment and retrofitting of RC structures. Taylor & Francis, London, UK (2007): 1011-1018. This entry was posted in Inspection and Evaluation, NDT, Ultrasonic Testing and tagged cracking. Bookmark the permalink. Post results what is the effective way to restore it rather to demolish the whole structure.